Hi Everyone! This is quite exciting for me. I haven had the time to participate in any challenges last year but I'm starting it again this year. I love challenges because sometimes it makes it go outside of my comfort zone and sometimes, it's just an excuse for me to buy new products! hehe. I finally got my hands on my first Neat & Tangle stamps and I'm using it to join my first Little Tangles Challenge. For this challenge, as you can see below, the theme is Hello. 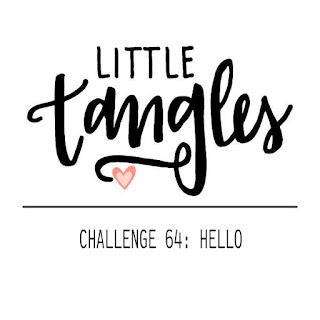 Click on the challenge image below to get to the Little Tangles blog. Here's my entry. I started of by just cutting out a tag out of watercolour paper. I used the heart from the Heart Of Gold (by Neat & Tangled) by heat embossing it in gold. I used various Distress Ink Markers to colour in those individual shapes :) The hello die-cut is from the Tiny Words dies (by Create A Smile). Hope you've enjoyed my entry! This is gorgeous!! Thanks for joining us at Little Tangles! So pretty, beautiful choice of colors and awesome watercoloring! Love the tiny word and all the gold--Stickles are my fave! Wonderful colors and I love your shading on those facets. This is beautiful! I love the watercolor work you did on it, and those faceted hearts are beautiful! !